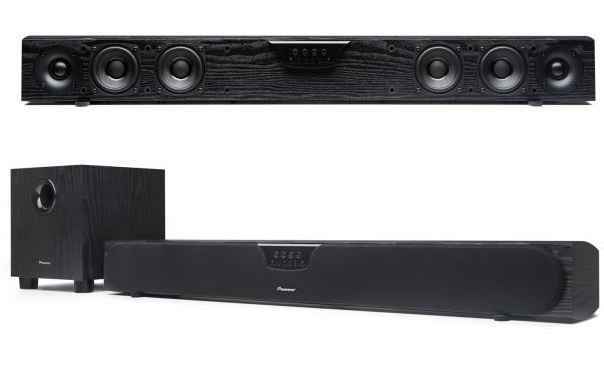 Pioneer Electronics just unveiled their all new Speaker Bar system – the SP-SB23W. This new SP-SB23W has been designed by legendary speaker engineer Andrew Jones, it features a composite wood curved cabinet, six individual speakers with discreet amplifcations i.e. six amplifiers, and an eight channel active digital crossover network. The design was focused on providing better sounds with wider off-axis response, higher power handling and increased dynamic headroom. • Composite Wood Cabinet – rather unique in the speaker / soundbar category, this new Speaker Bar uses a composite wood cabinet rather than the more typical plastic enclosure, to provide greater resistance to unwanted resonance. The enclosure is a specially designed RF molded curved design to minimize”flexing” and therefore, greatly improve audio reproduction. • Six Speaker Design – six individual drivers, four custom 3-inch woofers, and two 1-inch soft dome tweeters. The woofers use a vented pole piece for improved bass response and the 1-inch soft-dome tweeters are encased in a custom “wave guide” for increased output sensitivity and controlled dispersion. • Individual Amplifiers for Each Driver – six individual amplifiers to power each independent driver, each producing up to 28 Watts of power (1kHz 1% THD @ 4 Ohm). • Active Crossover Network – an active crossover network, allowing higher order filter points to achieve improved audio transitions between the woofers and the tweeters for improved speaker response, mid-range clarity and dispersion. • 6.5-inch Subwoofer – matching wireless subwoofer featuring a 6.5-inch driver tuned to 42 Hz (-10 dB) to provide low bass frequencies. The subwoofer is powered by a built-in 50 Watt amplifier (50Hz 1% THD @ 6 Ohms) and the output level can be adjusted from the convenience of the included Speaker Bar remote. • Additional Features – Dolby Digital Decoding and three sound modes including music, movies and dialogue. Pioneer’s Speaker Bar comes with an optical cable and wall mounts for convenient set-up and will be available in the fall with a suggested retail price of $399 U.S. For more information, see: www.pioneerelectronics.ca.